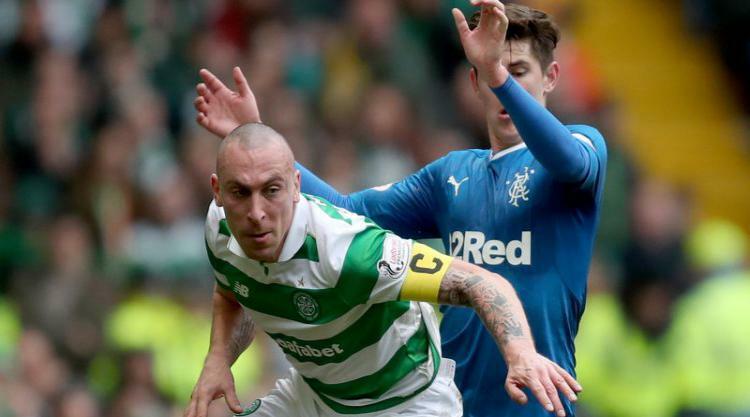 Skipper Scott Brown sent out a warning to Rangers by claiming Celtic have improved since their comprehensive 5-1 victory at Ibrox. Brendan Rodgers’ side went unbeaten on their way to the domestic treble last season and knocked the Light Blues out of both major cup competitions at the semi-final stage. Rangers took just one point from four Ladbrokes Premiership games with Celtic and were on the end of two 5-1 thrashings, the latest at Ibrox in April. Celtic have since extended their unbeaten run against Scottish clubs to 56 games ahead of the first Old Firm game of the season on Saturday lunchtime. Asked if the Parkhead side were better than the last time they visited Govan, the Scotland captain said: “Yeah, we are stronger, we are fitter and more together as well. The 32-year-old midfielder claimed Celtic’s dominant 4-0 Betfred Cup quarter-final win over Dundee at Dens Park on Wednesday night exemplified Rodgers’ desire to keep raising standards at the club. “The gaffer is always raising the bar as far as it can go,” Brown said. “He was delighted with that performance in midweek against Dundee. But there is always room for improvement and here’s hoping we can do that on Saturday. Rangers could have upwards of six players featuring in their first Old Firm game, while the vast majority of the Hoops squad have been over the course before and Brown is relishing a return to Ibrox. “Experience is great but I am sure they will relish the challenge as well, playing in front of their own fans,” the former Hibernian player said. “We are looking forward to it as well. Hopefully everyone had a great night last night. have a great 2017 now ???????? Much has been made of the injury problems Rangers boss Pedro Caixinha has ahead of the lunchtime kick-off. Captain Lee Wallace and centre-back Danny Wilson are both out with respective groin and calf injuries. Experienced Portuguese defender Bruno Alves faces a race against time to be fit after picking up a calf complaint, as does fellow defender Declan John with a thigh problem. If Alves fails to recover, it could mean a first start for teenager Ross McCrorie.